Your experience with almonds in a windy site sounds too familiar. We planted six trees six years ago and this year harvested six nuts! They struggle but we’re not ready to give up yet. A bigger loss to the gales that hit Golden Bay at the end of January was our complete pear crop (okay, a couple of dozen fruit) and most of the apple crop. I’ve decided not to thin young fruit anymore and see what we get after the wind and pukeko have been through the orchard. Six years ago! Crikey. I read on the net that almonds should hit full production in five years. Hope yours are just slow starters! When I planted our orchard I had two options: a sunny north-facing paddock that’s fairly sheltered but has no access to water; or a windy, south-facing paddock within reach of the hose. So had to go with the latter. A couple of the apple trees were blown out of the ground this summer. We’ve got as far as buying bigger stakes but haven’t got them in the ground yet. Our whole property (1 hectare) is on pakihi soil which makes life interesting and gardening a challenge. 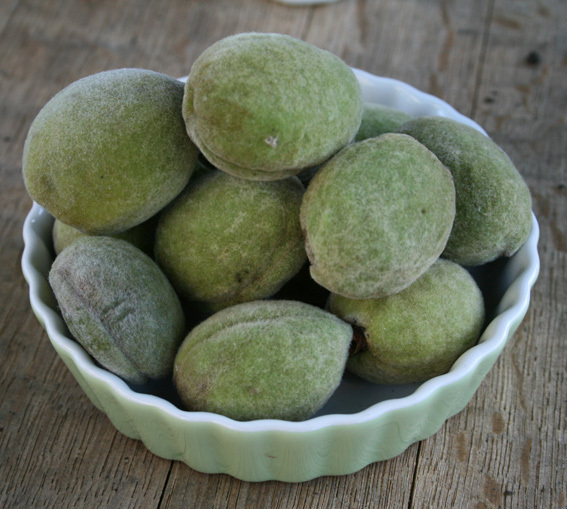 We should probably give up on the almonds, stone fruit on the whole doesn’t do that well. Pipfruit on the other hand, does. I think the apples actually like the wind and we have no black spot at all, though I’m probably tempting fate to say that. I’ll be following the growth of your almonds with interest. I must say, I’ve been amazed at how easy apples seem to be to grow. Our trees, which have only been in for 18 months, have kilos and kilos of fruit this season. We’re eating apple pies & apple shortcakes & flinging apples into savoury casseroles most days. Our two fig trees have the best crop of all the fruit, and they’re small enough to fling a net over. But the best bounty from our garden this year has been a bumper crop of eggplant, so many I’ve been giving them away, roasting then freezing and making brinjal pickle.